Kilkenny’s Mark Power, Portmarnock’s Conor Purcell and Dundalk’s Caolan Rafferty were joined on Wednesday morning in Spain by Naas’ Rob Brazill who was a last minute addition to the team when Mallow’s James Sugrue was forced out due to injury. Just like on day one, it was Brazill who endured the toughest day of the quartet with a 79 but it was a tougher day all round for Team Ireland as Power fell out of second place in the individual standings with a six-over par 78. Collectively, Power, Purcell and Rafferty combined for a 10-over par second round score of 226 that trails leaders England by six shots and second placed Netherlands by two atop the leaderboard in the team standings. 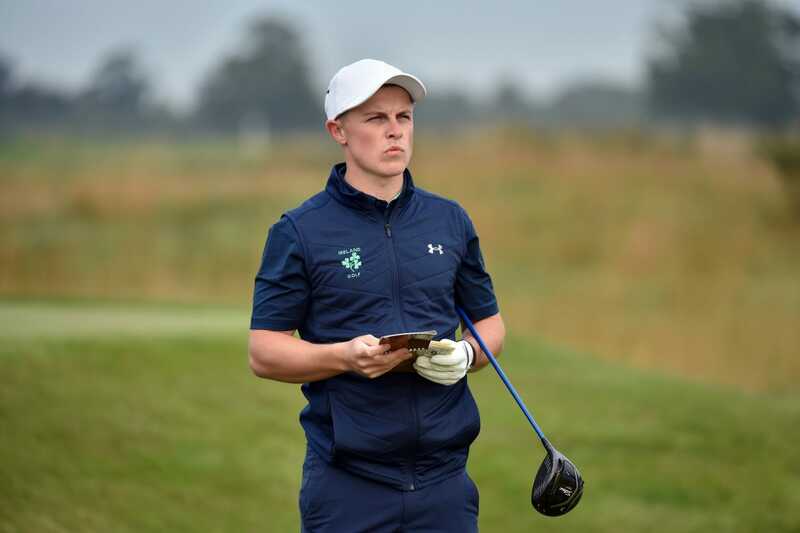 In the individual competition, Australian Amateur Champion Purcell now leads the Irish challenge in a share of sixth spot alongside West of Ireland champion, Caolan Rafferty as the compatriots returned a 75 and a 73 respectively. This week, Ireland are hoping to lift the team title that they last won in 2016. John White accompanies the team which is supported by Sport Ireland and Sport NI as part of the GUI’s High Performance Programme.